Remember my "Poll: which Belgium Strong Ale should I brew?" The post got 18 votes to tell me what to brew this past weekend. I'm glad a winner came out, because for awhile it was looking like the Dubbel and the Golden Strong were going to tie. Before I left on my South Dakota vacation, I designed a recipe and bought the malts. 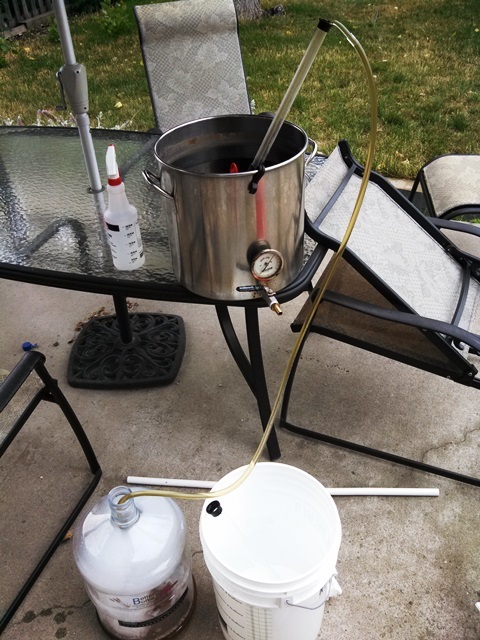 Sunday, after getting home from vacation on Saturday, I brewed NSFW Belgium Golden Strong Ale. Feel free to follow the link and review the recipe. In case you don't know, "NSFW" refers to "Not Safe for Work". I am naming it this because I will probably bring some into work to share and because it is the highest alcohol beer I've ever created. As a Belgium Golden Strong is supposed to finish very dry, lots of the fermentables in the recipe are plain old cane sugar, and I decided that I am going to add those during fermentation as opposed to adding them in the boil and have them ferment all the way through. Thus, my OG into the fermenter was expected to be 1.059, which really is not that big a beer. I started the Sunday brew early. 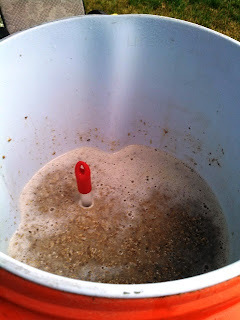 As usual, the goal was to let the mash work through church. Getting the right starting mash temperature took a bit of adjusting, but not too bad. Things went fine and the wort going into the pots tasted wonderful. 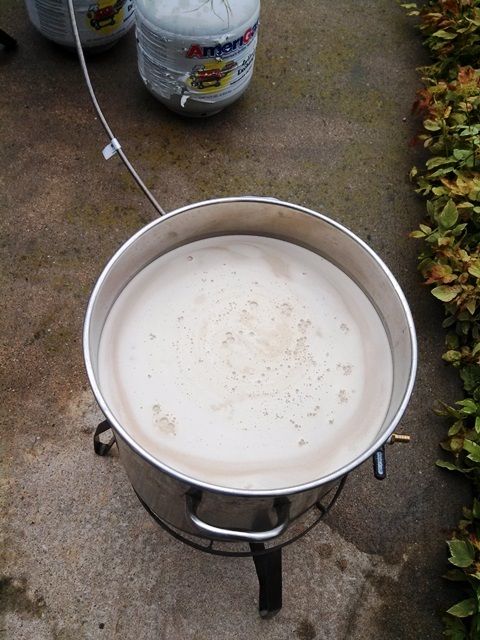 Somehow, though, my pre-boil gravity was about 6 points low. This is extremely unusual for me, and I wonder if I measured the grain wrong. I ended up adding about 3/4 of a pound of DME to bring the gravity up to where I wanted it. The boil was pretty uneventful other than having to add the DME. 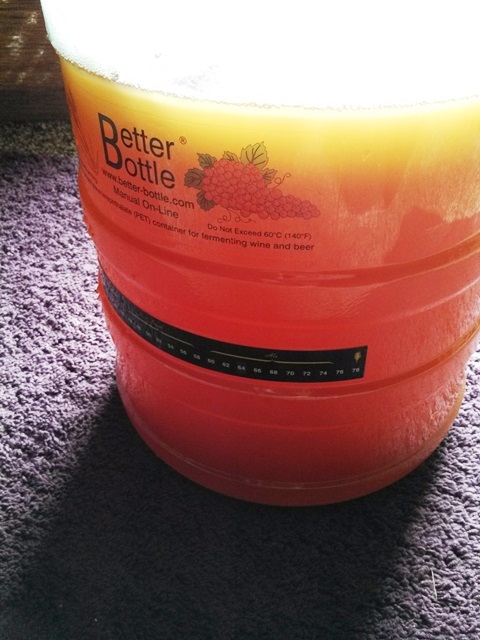 As has become sop for me, I cooled with my wort chiller to 75 or 80 and then racked into my smaller better bottle fermentor. I let that cool in an ice bath in my mash tun for awhile and then racked the clearer wort from the top into my bigger fermentor. I pitched two types of yeast (see the recipe) and threw in some Clarity Ferm. Not sure if this will end up being tried by gluten sensitive friends, but I did want to try to get a very clear beer. The fermentation started off before the end of the day, and the beer has been in the low 60's the whole time so far. Things are very active now. I may need a blow-off tube. 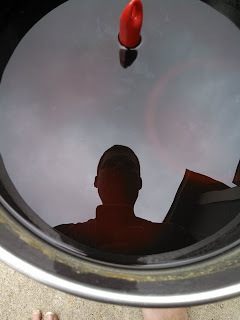 Every two days or so I will be adding part of the table sugar to the fermentation. It will end up being 2 lbs, which seems like a lot, but is actually less than Jamil used in his Brewing Classic Styles Golden Strong Recipe. Still, I am a little worried about adding that much simple sugar. I suppose I will see how it goes. I am planning on bottling most or maybe even all of this batch. I'll probably want to hang onto some to see how it ages. I'll be sure to let you know how it turns out. Now that I have brewed a Belgium Strong Ale, I just have 5 more categories I have to hit. This should not be a problem. But I never got a vote for tripel. I don't know if your vote for dubbel went through or not. Crap. Now we have controversy. Now the results are in question. Maybe I should brew a dubbel just in case. Poll: which Belgium Strong Ale should I brew?